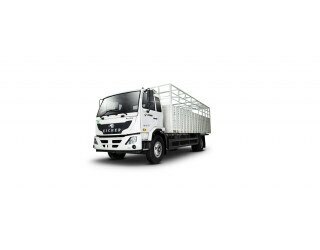 Dec 28, 2018: The Eicher Pro 3016AMT is an excellent truck and comes with a box body. The truck gets a sleeper cabin and the gross vehicle weight is 16.2 tonnes. Inside the cabin, it is equipped with a power and tiltable steering and a driver information display. The vehicle comes with air brakes for the braking purpose. Doing the suspension duties, parabolic leaf spring with shock absorber at the front and semi-elliptic leaf spring at the rear are present. Moreover, the semi-elliptic leaf spring at the front is given as optional. The four-cylinder engine can make a maximum of 165 bhp power, which comes at 2,600 rpm, and the peak torque sticks at 520 Nm, coming at 1,400-1,800 rpm. The engine comes mated to a 6-speed automatic transmission.